Open from 9am Mon-Sat. Closed Sun. Bottle shop bar from AB InBev. 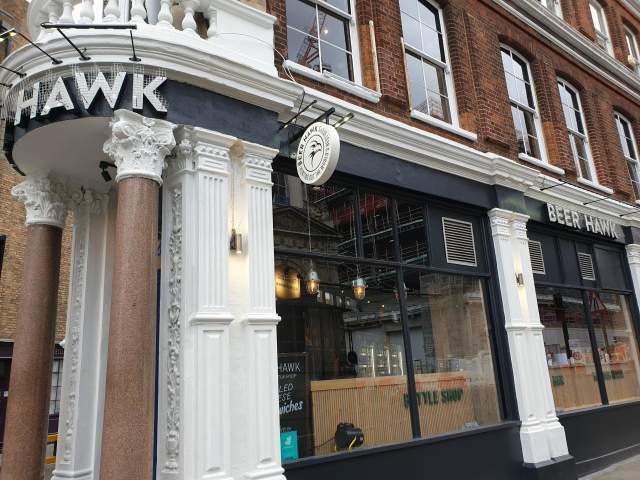 The second London Beer Hawk is now open in Farringdon. Occupying a wedge shaped building opposite Smithfield Market, it carries a range of c.12 drafts and around 140 bottles/cans. While the range includes a significant amount of AB InBev products, it also offers many from other breweries, so you should always find something good to drink here. Unusually for the area, it opens on Saturdays, for the moment at least. There is a lovely upstairs area with lots of additional seating. NB: card only, no cash.